In his 2009 feature-film debut, South African director Neill Blomkamp gave us the science fiction gem that is District 9, a stirring, gritty, and visually stunning allegory for how apartheid divided his home country. Blomkamp’s most recent foray into the science fiction genre, CHAPPiE, reflects one of society’s growing fears—the fear of a police force that has been granted greater technology, power, and room for corruption. 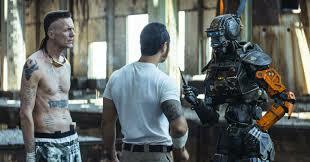 With victims’ names like Michael Brown, Trayvon Martin, John Crawford, and Jordan Davis making the headlines this past year, movies like CHAPPiE provide not only some intense escapism, but also a chilling look at what the day after tomorrow could bring if technology and power is placed in the hands of a corrupt and desperate police force. 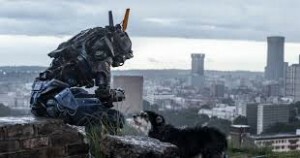 While the urban struggle of CHAPPiE could easily be set in L.A., New York, or even Ferguson, CHAPPiE is set in the grimy underworld of Blomkamp’s backyard—Johannesburg. Dev Patel (Slumdog Millionaire, HBO’s The Newsroom) plays computer programmer Deon Wilson—the Dr. Frankenstein to the recently conscious and curious creature that is CHAPPiE. Unlike Frankenstein, however, Deon is a much more nurturing parent, entreating his titanium-enforced newborn that he should never let anyone tell him that he can’t do something. The AI promises his maker that he will never break the law to serve his own needs and desires. As the former police robot learns to speak, to shoot, and to sass, the audience is treated to one of the best non-human character arcs since Lance Henriksen’s Bishop in Aliens (1986). This tin man conveys personality, vulnerability, and—much like Rutger Hauer’s Roy Baty in Blade Runner (1982)—a burning desire to live beyond his battery life. The cast is rounded out by Hugh Jackman, taking a turn as a villainous, ex-military weapons designer (for fans of the X-Men franchise, this film may be the closest opportunity to see Wolverine clobbered by a colossus). Sigourney Weaver (is there any stronger go-to actress in the genre of science fiction than Miss Weaver?) turns in another fine performance that echoes the disdain Lieutenant Ripley had for androids in Ridley Scott’s Alien (1979). Real-life musical misfits Ninja and Yo-landi—members of the electronica/rap outfit Die Antwoord—play hyper-realized gangster versions of their musical personas, and even lend a song or two to propel the film’s action sequences. A good friend pointed out that Blomkamp staple Sharlto Copley was notably absent from this film. Fans may recall Copley as the infected protagonist Wikus Van De Merwe from District 9 or as the wicked rogue assassin Kruger from 2013’s Elysium (another sci-fi romp helmed by Blomkamp). I politely pointed out that Copley is indeed in CHAPPiE, lending his distinct and expressive voice to the title character. One could argue that the real societal fear being portrayed in CHAPPiE is an AI anxiety—a phobia of machines developing consciousness and over-powering their shortsighted creators. However, the film is much less The Terminator (1984) or I, Robot (2004) and much more RoboCop (1987) or Judge Dredd (1995). These latter two films have enjoyed reboots in the last few years, reflecting the growing (trending?) fear of a too-powerful, almost omnipotent police force. During the climactic battle, the MOOSE weaponry sent to destroy CHAPPiE looks like a cut and paste from the clunky behemoth sent to dispatch Peter Weller in the original RoboCop. Just before I was about to cry, “Foul!” however, Blomkamp made his upgrade fly! The Day the Earth Stood Still (1956)—released at the height of the Red Scare and a few years after McCarthyism–reflected the American concern over the arms race, Russia as a nuclear threat, and the seeming inevitability of World War III. Blade Runner showed how pollution, urbanization, and the abuse of technology would corrupt a not-too-distant Los Angeles. Like the overlooked Arnold Schwarzenegger movie The 6th Day (2000), the superior Moon (2009) reflects the fear of cloning and—to a lesser extent—how we are expending our planet’s resources. CHAPPiE continues the science fiction tradition by capturing a legitimate societal fear—specifically the fear of a violent and uncontrollable police force—and portraying a just-around-the-corner dystopia where mankind’s evolution has led to suffering, chaos, and injustice. Regarding other science fiction films that delve specifically into a futuristic authority, CHAPPiE is less campy than Demolition Man (1995) and not as stylized and haunting as Equilibrium (2002). Fans who are hoping to see a film about the perils of trusting artificial intelligence will find these two hours less cryptic and graceful than 2001: A Space Odyssey (1968) but far more adrenalin-inducing than Her (2013). Until CNN stops featuring headlines like “War Gear Flows to Police Departments,” and quiet little cities like Neenah, Wisconsin (pop. 25,000) stop getting MRAPs (mine-resistant ambush-protected armored vehicles), films like CHAPPiE will continue to strike a nerve and reach a devoted, interested, and concerned audience. My hope is that the actual future of law-enforcement technology is closer to Johnny Five from Short Circuit (1986) than to Blomkamp’s bleak but solidly entertaining vision.